Krafting Kreations: Reason to Smile! Today I have to share with you the first card from the July Make and Take. During July the Reason to Smile promotion was going on where you could get the stamp set for just $5.00 if you ordered $50 or more in merchandise. Well, I definitely wanted to show this stamp set off to my guests, so I created this card. Accessories: Rich Razzleberry Re-inker, Lucky Limeade Marker, Glue Dots, Whisper White Stitched grosgrain ribbon, Stampin’ Dimensionals, Blender Pen. I started off by cutting a piece of Crumb Cake card stock 5-1/2” x 8-1/2” and scoring it at 4-1/4”. I stamped the blossom image onto the Crumb Cake card front several times in Crumb Cake ink. This just gives it a subtle pattern to the background. Next I cut a piece of International Bazaar DSP 2-1/4” x 4-1/4”. I adhered this onto a piece of Pool Party card stock that was 2-1/2” x 4-1/4” and adhered the panel onto the right side of the card front. For the image panel I started off with a piece of Whisper White card stock cut at 2-1/4” x 3-1/2”. 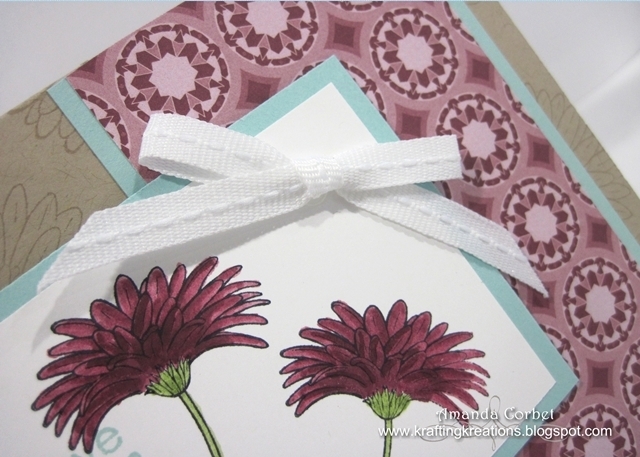 I stamped the flower with the stem twice onto the card stock with Black Stazon ink. I used the Lucky Limeade marker to color in the flower stems. Then I used my Blender Pen with a little bit of Rich Razzleberry Re-inker to color in the flower blossoms. You really only need a teeny tiny bit of re-inker on your blender pen to color this in! 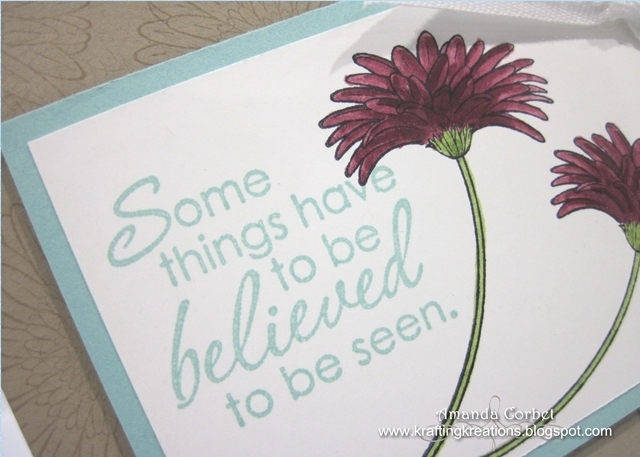 I stamped the greeting from Just Believe onto the left side of the card stock in Pool Party ink. Then I adhered this panel onto a 2-1/2” x 3-3/4” piece of Pool Party card stock. This panel was adhered onto the card front with Stampin’ Dimensionals. To finish it off I tied a bow in some Whisper White stitched grosgrain ribbon and adhered the bow onto the image panel with a Glue Dot. When I finished this card I did a little happy dance! It turned out just the way I imagined it, and it looks amazing! Everyone at the make and take loved it too! Have you made anything with the Reason to Smile set?